The royal titulary or royal protocol is the standard naming convention taken by the pharaohs of ancient Egypt. It symbolises worldly power and holy might and also acts as a sort of mission statement for the reign of a monarch (sometimes it even changed during the reign). The full titulary, consisting of five names, did not come into standard usage until the Middle Kingdom but remained in use as late as the Roman Empire. The Horus name is the oldest form of the pharaoh's name, originating in prehistoric Egypt. Many of the oldest-known Egyptian pharaohs were known only by this title. 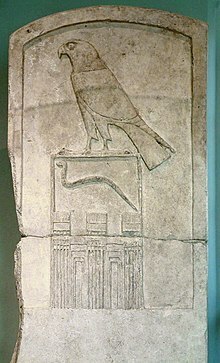 The Horus name was usually written in a serekh, a representation of a palace façade. The name of the pharaoh was written in hieroglyphs inside this representation of a palace. Typically an image of the falcon god Horus was perched on top of or beside it. At least one Egyptian ruler, the Second Dynasty pharoah Seth-Peribsen, used an image of the god Set instead of Horus, perhaps signifying an internal religious division within the country. He was succeeded by Khasekhemwy, who placed the symbols of both Set and Horus above his name. Thereafter, the image of Horus always appeared alongside the name of the pharaoh. By the time of the New Kingdom, the Horus name was often written without the enclosing serekh. Wadjet, patron deity of Lower Egypt, represented by a cobra. The name is first definitively used by the First Dynasty pharaoh Semerkhet, though it only became a fully independent title by the Twelfth Dynasty. This particular name was not typically framed by a cartouche or serekh, but always begins with the hieroglyphs of a vulture and cobra resting upon two baskets, the dual noun "nebty". Also known as the Golden Horus Name, this form of the pharaoh's name typically featured the image of a Horus falcon perched above or beside the hieroglyph for gold. The meaning of this particular title has been disputed. One belief is that it represents the triumph of Horus over his uncle Seth, as the symbol for gold can be taken to mean that Horus was "superior to his foes". Gold also was strongly associated in the ancient Egyptian mind with eternity, so this may have been intended to convey the pharaoh's eternal Horus name. Similar to the Nebty name, this particular name typically was not framed by a cartouche or serekh. The pharaoh's throne name, the first of the two names written inside a cartouche, and usually accompanied the title nsw-bity (nsw(t)-bjt(j)), traditionally interpreted as "[He] of sedge [and] bee" and often translated for convenience as "King of Upper and of Lower Egypt", with the sedge and bee being symbols for Upper and Lower Egypt, respectively, although recent research has thrown this interpretation into doubt. This was the name given at birth. The name itself was preceded by the title "Son of Ra", written with the hieroglyph of a duck (za), a homonym for the word meaning "son" (za), adjacent to an image of the sun, a hieroglyph for the chief solar deity Ra. It was first introduced to the set of royal titles in the Fourth Dynasty and emphasizes the king's role as a representative of the solar god Ra. For women who became pharaoh, the preceding title was interpreted as "daughter" also. Modern historians typically refer to the ancient kings of Egypt by this name, adding ordinals (e.g. "II", "III") to distinguish between different individuals bearing the same name. In the Middle Kingdom, the full titulary was sometimes written in a single cartouche, as in this example from Senusret I, from Beni Hasan. Horus name: Wesretkau, "Mighty of Kas"
Nebty name: Wadjrenput, "She of the Two Ladies, Flourishing of years"
Praenomen: Maatkare, "Truth [Ma'at] is the Ka of Re"
Nomen: Khnumt-Amun Hatshepsut, "Joined with Amun, Foremost of Noble Ladies"
Horus name: Kanakht Khaemwaset, "Horus Mighty Bull, Arising in Thebes"
Nebty name: Wahnesytmireempet, "He of the Two Ladies, Enduring in kingship like Re in heaven"
Golden Horus: Sekhempahtydjeserkhaw, "Horus of Gold Powerful of strength, Sacred of appearance"
Praenomen: Menkheperre, "He of the Sedge and the Bee, Enduring of form is Re"
Nomen: Thutmose Neferkheperu, "Son of Ra, Thutmose, beautiful of forms"
Allen, James P. (1999). Middle Egyptian: An Introduction to the Language and Culture of Hieroglyphs. New York: Cambridge University Press. ISBN 978-0-521-77483-3. Dodson, Aidan Mark; Dyan Hilton (2004). The Complete Royal Families of Ancient Egypt. Cairo, London, and New York: The American University in Cairo Press and Thames and Hudson. ISBN 978-977-424-878-8. Ronald J. Leprohon (2013). The Great Name: Ancient Egyptian Royal Titulary. Society of Biblical Literature. ISBN 978-1589837355. Gardiner, Alan Henderson (1957). Egyptian Grammar; Being an Introduction to the Study of Hieroglyphs (3rd ed.). Oxford: Griffith Institute. Quirke, Stephen G. J. (1990). Who Were the Pharaohs? A History of Their Names with a List of Cartouches. London: British Museum Publications Limited. Schneider, Thomas (1993). "Zur Etymologie der Bezeichnung 'König von Ober- und Unterägypten'". Zeitschrift für ägyptische Sprache und Altertumskunde. 120: 166–181. Shaw, Garry J. (2012). The Pharaoh, Life at Court and on Campaign. London and New York: Thames and Hudson. pp. 20–21. von Beckerath, Jürgen (1999). Handbuch der ägyptischen Königsnamen (2nd ed.). Mainz am Rhein: Verlag Philipp von Zabern. ^ a b c Toby A. H. Wilkinson: Early Dynastic Egypt. Routledge, London/New York 1999, ISBN 0-415-18633-1, p. 74-75. ^ Ewa Wasilewska, Creation Stories of the Middle East, 2000, 130f. The Gold name, the Horus name, the Royal Titulary, the Two Ladies and Thutmose I on Digital Egypt.